The game "Sorry" is one of the big classics of the board games. This game that has pleased many families for 80 years. It's a game of luck, strategy and determination. The game is simple to learn and play, it has enough detail in it to be fun even for people who like complex strategy. 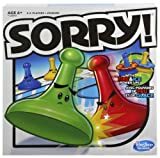 Because of the simple, but fun play of the game, Sorry continues being a favorite board game generation after generation. Most often it is found within a family's game closet and one which is remembered being played as a child. 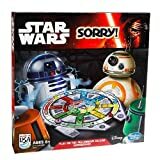 Sorry is known as the game of "sweet revenge," since players can send each other's pawns back to the starting line, thus forcing one another to lose ground and begin all over again. Other than a few minor changes in appearance and packaging, the game of Sorry remains the same from when it was first published in the United States by Parker Brothers in 1934. The objective of SORRY! is to get all 4 of your colored pawns home before the other players. Each player chooses one color of pawns then places them on the starting position a board. Instead of dice, there are cards you draw randomly to determine how many spaces you can move your men. Getting to your home is where it becomes tricky in the game. As you can suspect, competition becomes a big part of the game when 4 players are out to get one another. Landing on the same spot as an opponent will bump them back to their starting place. 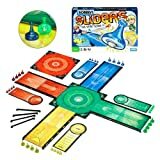 The board also features colored 'slide' squares that you can land on throughout the board as long as they are not your color. The last initial 7 or so squares are a 'safety zone' to any pawn of yours that enters it. Once you have your men herem they are safe from harms and now it takes the exact number to get your pawns home. There is very little strategy involved in this game beyond that. The lead changes often in a game of Sorry. You'll seldom see a game where a player is so far behind they have no chance of winning. When all players who are behind work against the leader, they have a 75% chance of getting a game-changing card in the four-player game. The game comes in many different themes ranging from The Simpson's to Spider-Man. It even reached such status that they've transported "Sorry" into several different types, such as "Sorry, the card game", "Sorry! On The Go" (for travel purposes), "Sorry Express" (involving dice), etc...). © 2017 Ultra BoardGames. All rights reserved.